I got 2 LACK tables at Ikea. The price varies based on the finish you choose… I chose flat white which was only $7.99 each! 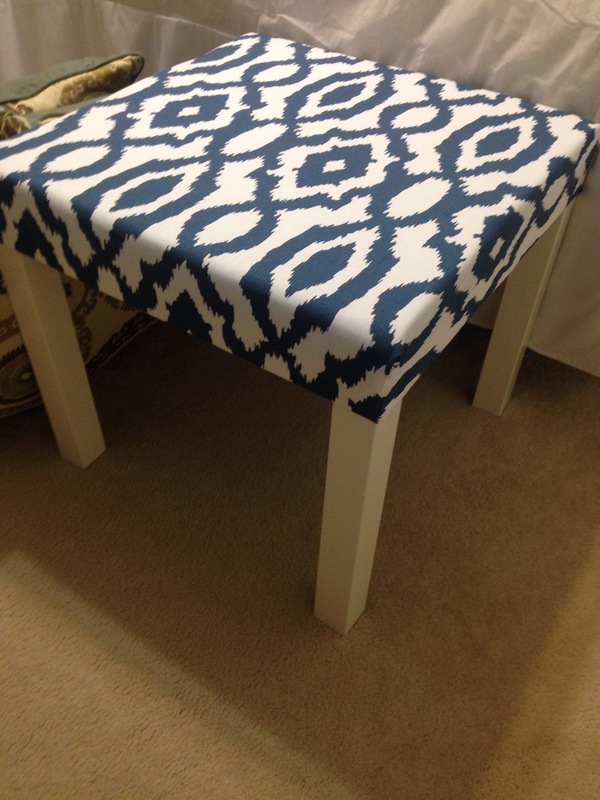 The tables are about 22″x 22″ so I grabbed pre-cut foam seating foam at Hancock Fabrics that happened to be the perfect size (and 2″ thick) for $8 each. 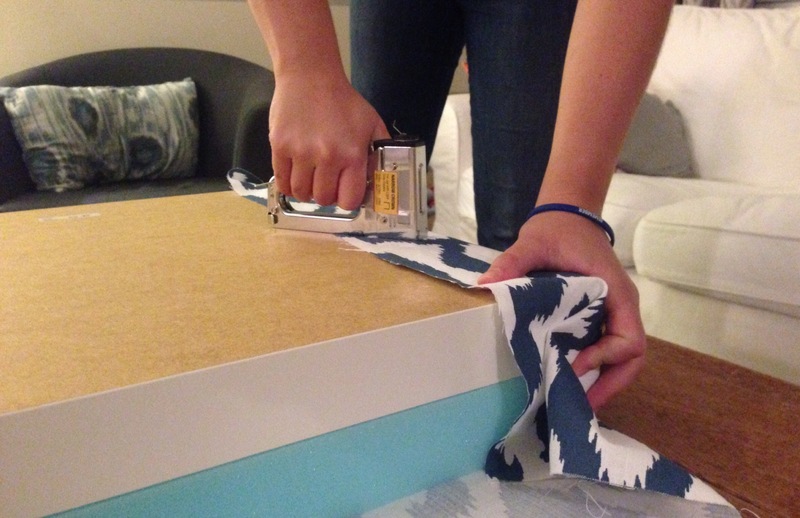 I already had fabric left over from my shower curtain headboard project. I thought it would be nice to have the ottomans match the headboard since they are the only color in the room for now (the rest is gray and white). Of course I didn’t hate that I already owned the fabric so no purchase was needed. If you don’t have fabric around consider using a curtain, bedspread or shower curtain instead. In this case, my material purchased as a $20 shower curtain was way cheaper than buying 3 yards of fabric. I eyeballed and cut the fabric like I would for wrapping a present. Then it was down to stapling. I just went around the edges stapling about an inch in. I made sure to trim as I went that I didn’t have any excess fabric that might hang down once I flipped the finished product over. 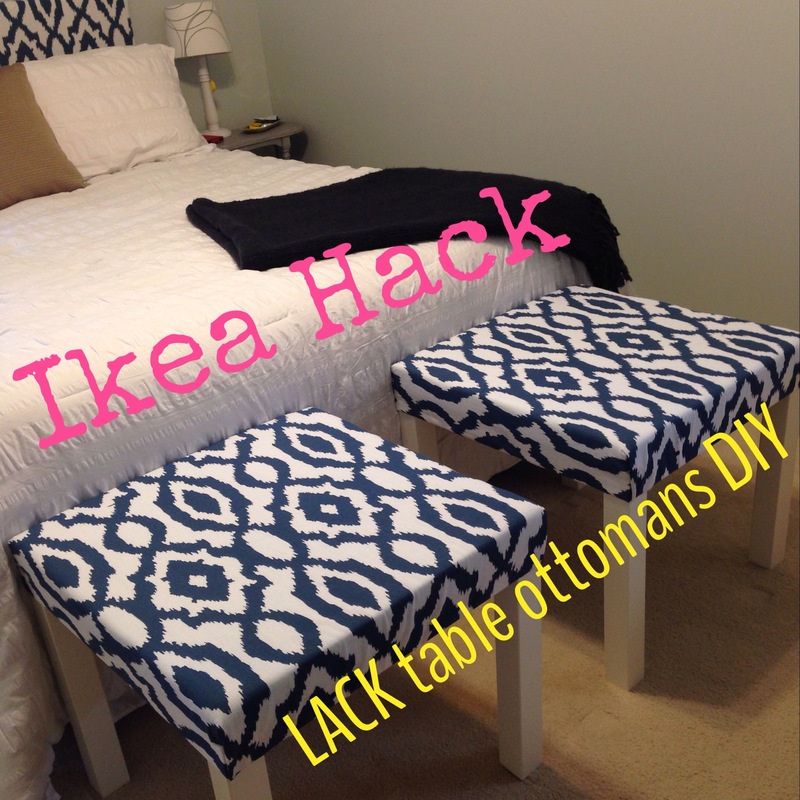 After I had stapled both of my ottomans I just added the legs to them like I would for the LACK coffee table instructions. So easy. A monkey could do this. This entire project took Molly and I less than a half hour between sips of milkshakes. It’s our weird kind of girls night in. My main goal is trying to keep these from becoming laundry collectors. So far they are staying clear of junk. I’ve notice that shoes end up under them but that’s okay with me. And when we unmake the bed at night the throw pillows go here rather than the floor, which is nice. I love the way they bring some color into the room and coordinate with the headboard. y final project price was $16 for each ottoman. Although our master bedroom needs more work this is definitely a step in the right direction! I’m tempted to add metallic golds as one of the accent colors in this room. What do you guys think?